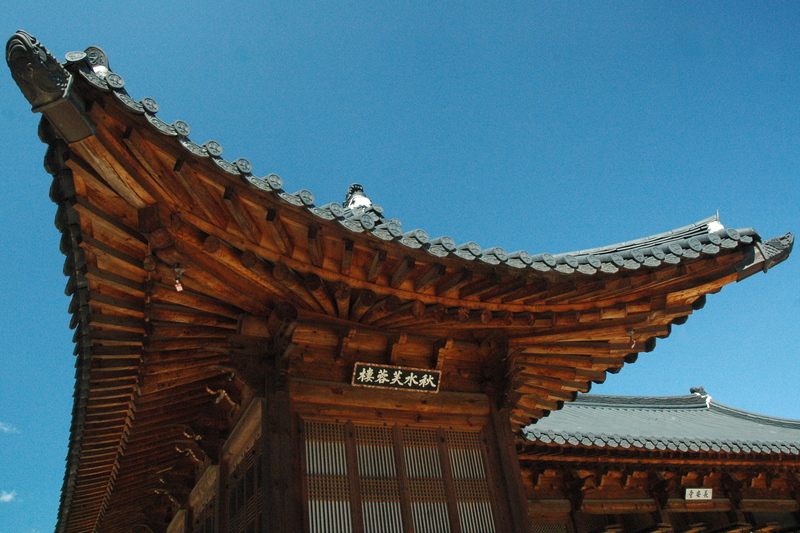 Built in 1395, Gyeongbokgung served as the main palace for more than five hundred years. Like the two temples I have been to, Bulguksa in Gyeongju and Haedong Yonggungsa in Busan, the palace was destroyed during the Japanese invasion of 1592. Although rebuilt in 1867, it was destroyed again in 1915. 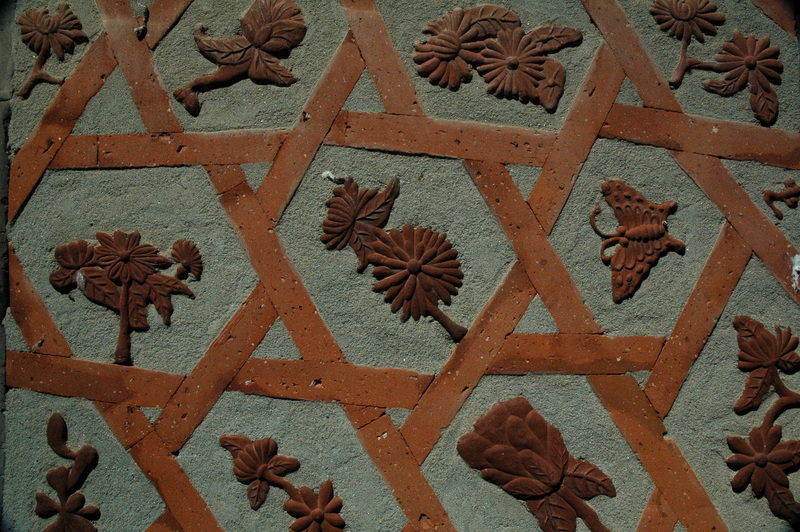 The palace we see today is the result of restorations that began in 1990. 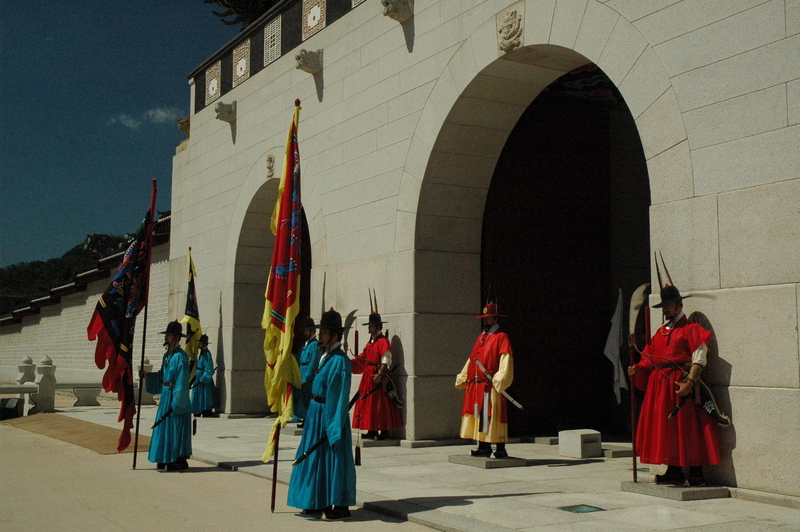 I arrived at the main gate, Gwanghwamun, just in time to see the end of the changing of the guard. My Korean boyfriend, Cho Kyuhyun, released a single last year called “At Gwanghwamun.” To probably no one’s surprise, I played it on repeat while at the gate (no worries, Harry Styles is still my British boyfriend). 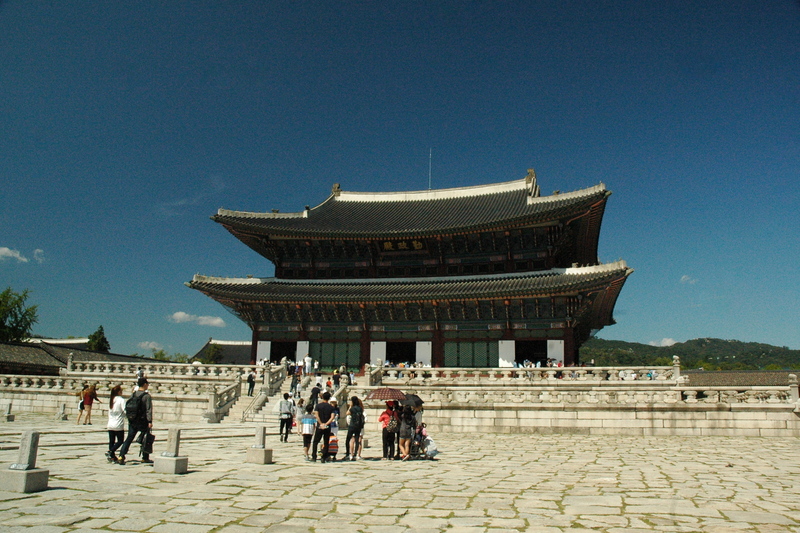 Anyway, Gwanghwamun has three entrances – the king would walk through the center one. 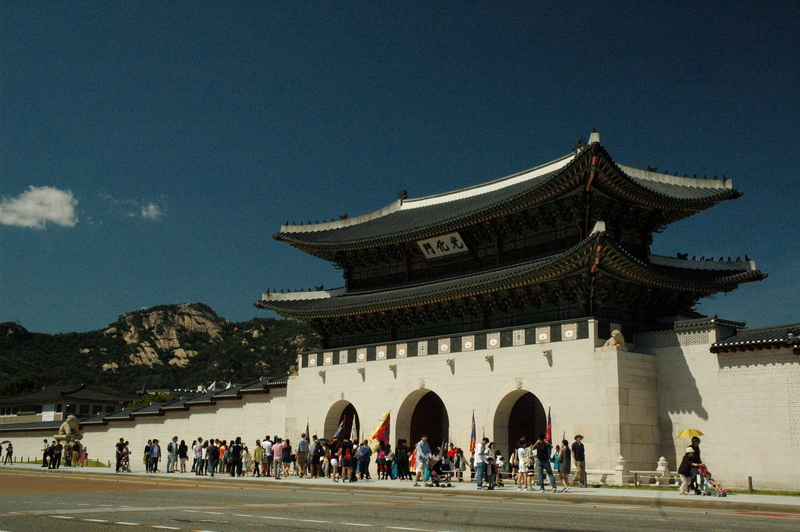 Unlike Gyeongbokgung, the gate was not destroyed during the invasion. It would later be moved to another location then leveled during the Korean War. 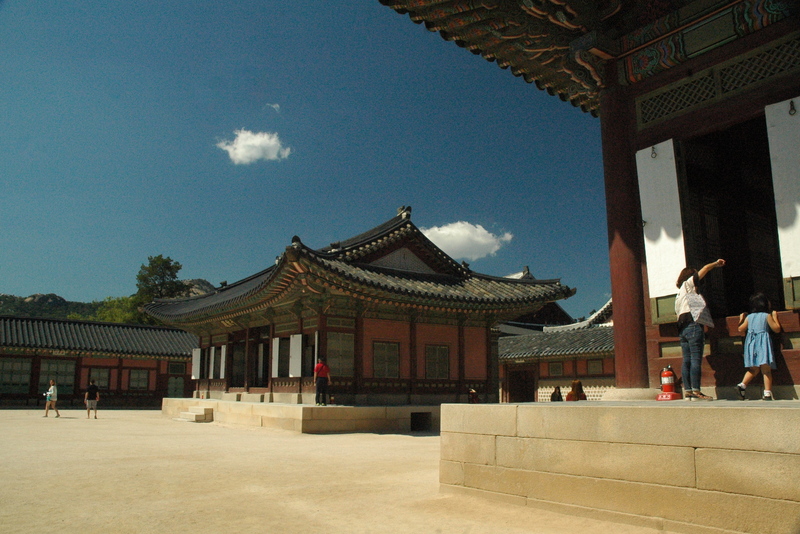 Gwanghwamun was moved back to its original place in 2006 and fully restored in 2010. Kyuhyun, this one is for you. Walking around the gate and seeing the changing of the guard is completely free. 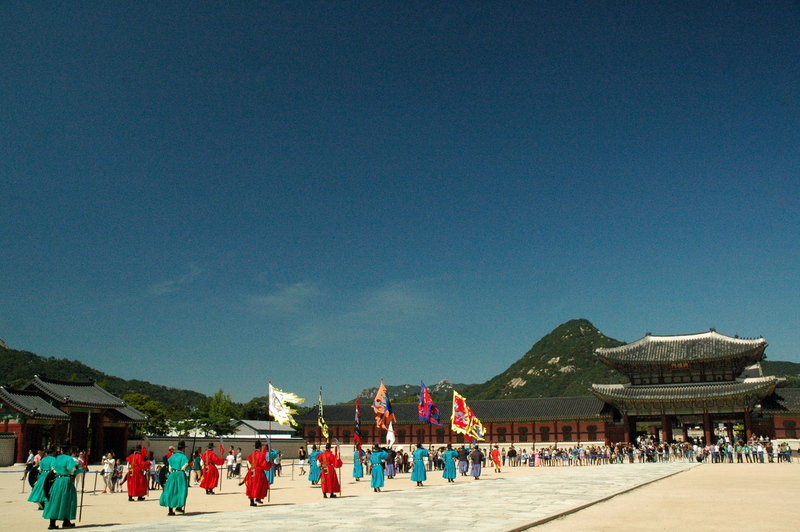 It cost me ₩3000 ($2.54) to enter the palace grounds. 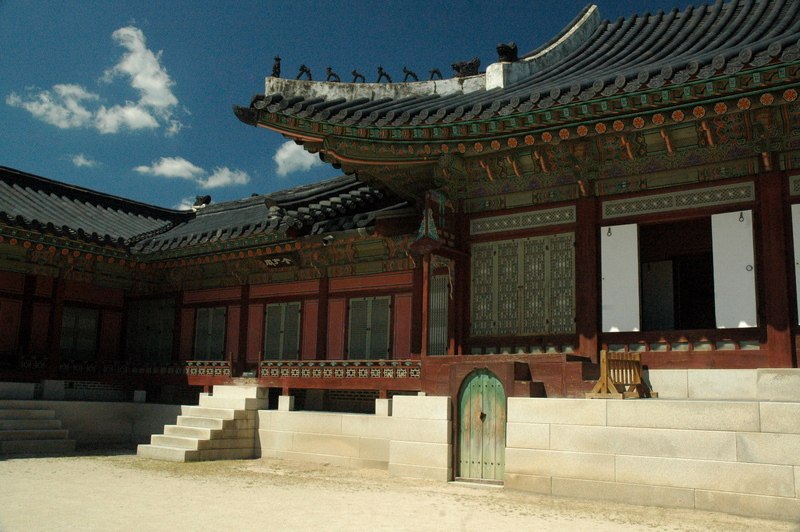 The first building I encountered was Geunjeongjeon (name meaning: “all affairs will be properly managed if Your Majesty demonstrates diligence”), the main throne hall. The coronation ceremony was conducted here. The next area, Sajeongjeon, has my favorite meaning: “hall where the king should think deeply before deciding what is right or wrong.” I am getting all of this information from the official guidebook I paid ₩500 ($0.42) for. Guidebooks > Audio guides. I also learned from the guide that “bird droppings are harmful to wooden structures.” All joking aside, the guidebook is awesome. Pick one up at the money exchange desk. 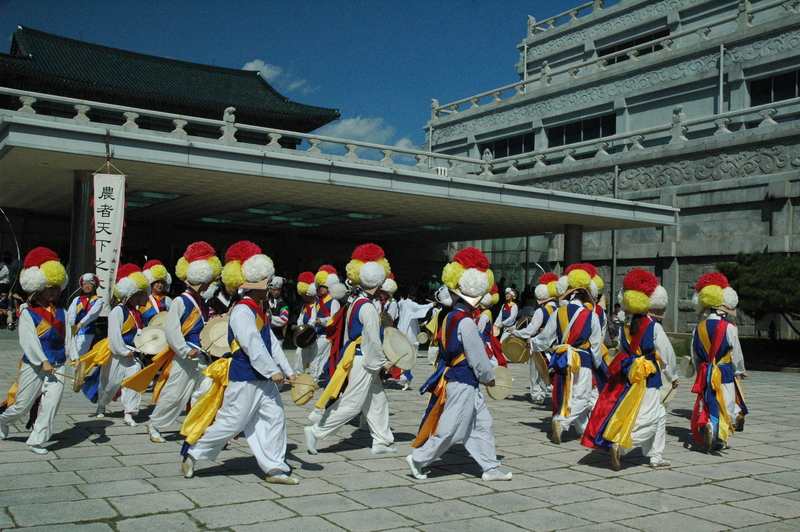 Saejeongjeon to the right and Cheonchujeon to the left. 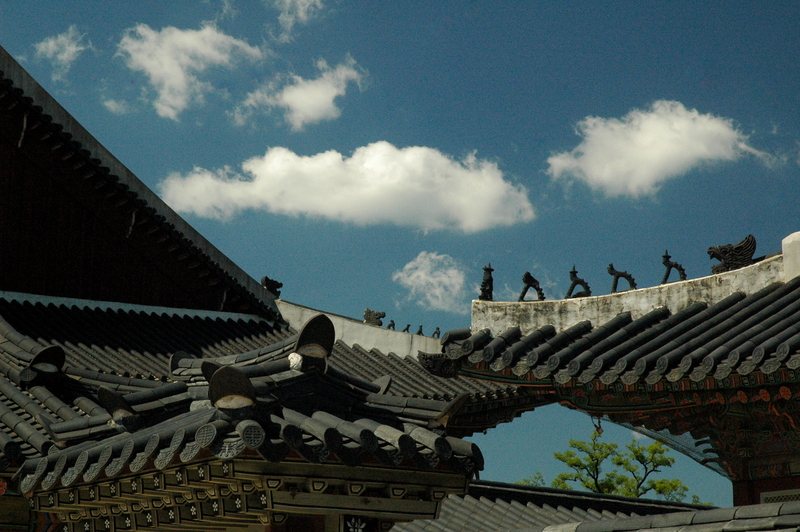 I strolled past Gangnyeongjeon (the king’s living quarters), Heumgyeonggak, and Hamwonjeon, and learned that the sundial and water clock were invented during the reign of King Sejong. 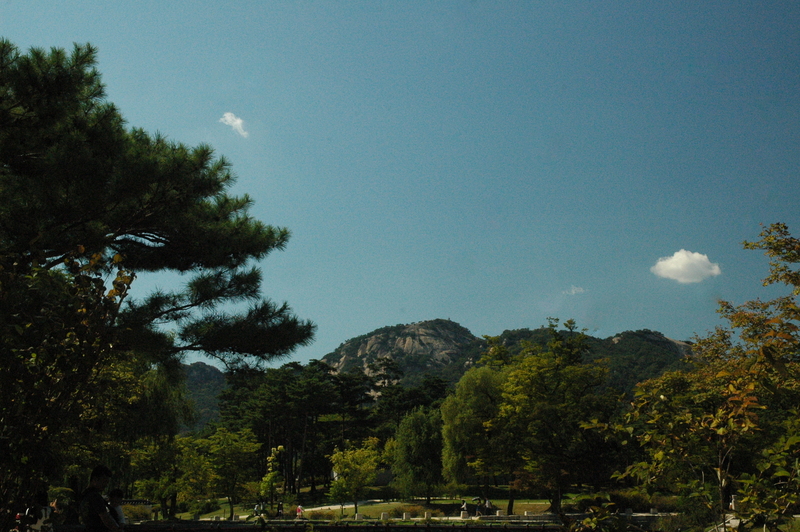 According to my pamphlet, “the fact that this sundial was built in the shape of a hemisphere shows that Joseon scientists at the time could accurately read the sun’s movement and knew that the Earth is round.” Hangul, the Korean alphabet, was also created during Sejong the Great’s reign. Living conditions improved, as it provided a way for people to write down their thoughts and ideas. This guy began rolling on the floor for fun. Since I was already at the museum, I decided to go inside. 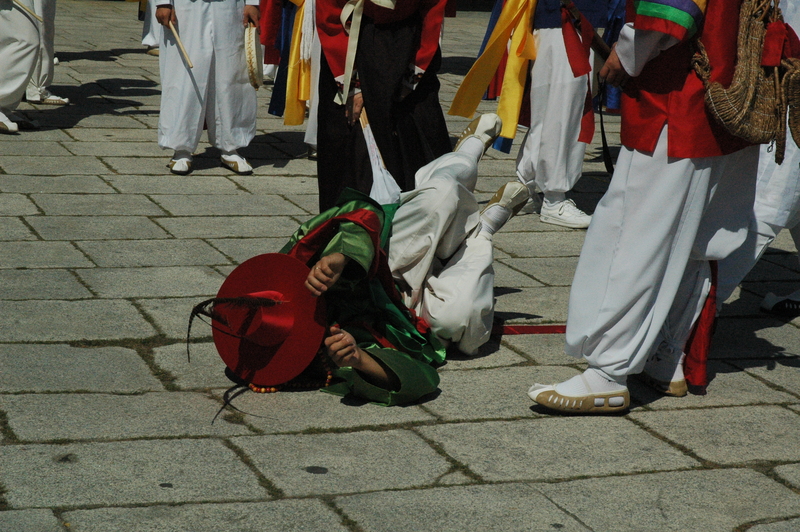 It upsets me that I do not know much about Korea. Although I listen to K-pop and am jamming out to KARA (카라) – Mamma Mia (맘마미아) as I type this paragraph, I need to learn Korean history. 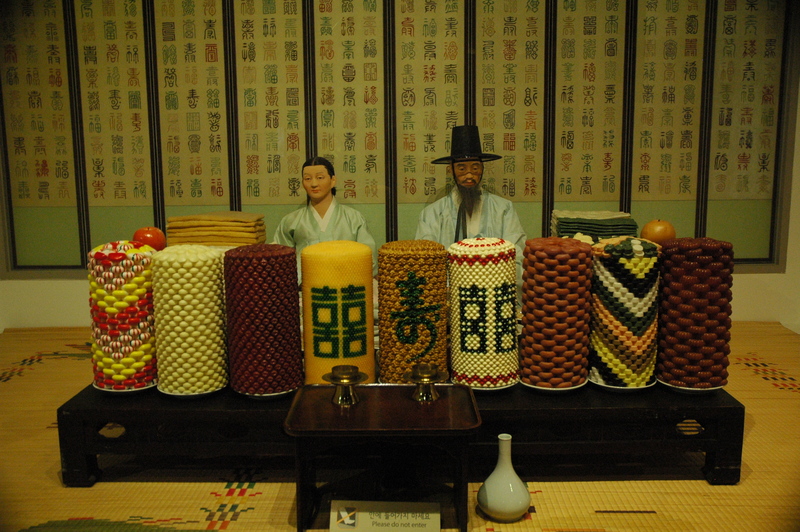 I have read about Crown Prince Sado (who was executed by placement in a rice chest) and his wife, Lady Hyegyeong, but that is about it. This process of “starting over” is interesting. Three years ago I knew no Hungarian and very little about Hungarian history. Now I have to begin again. As mentally daunting as this task could be, I look forward to it. I highly recommend visiting this museum! Admission is free. 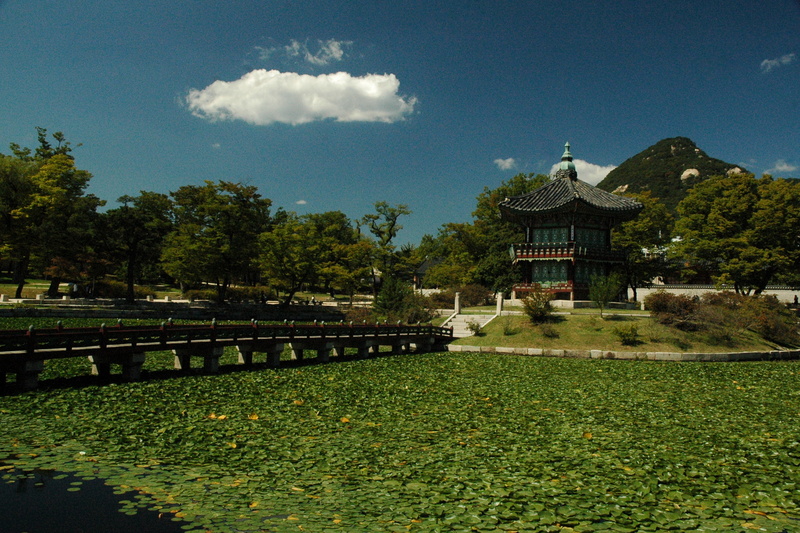 Unfortunately I missed out on the beautiful Gyeonghoeru Pavilion. I planned on seeing it after seeing Hyangwonji/Hyangwonjeong, but the Pungmul performers lured me in with their sweet drumming sounds. By the time I realized my mistake, I was already in Hongdae shamelessly ripping into a Crunchwrap Supreme. As sad as I was, at least I had Taco Bell to pat me on the back. As far as school concerned, I have been working full-time since the 2nd of this month. All is going well. I plan on writing posts about school and my flat soon. Now a late dinner of rice and seaweed is calling my name. I’m coming, food. I’m coming.